► Was the flashing light really the lighthouse? HALT: I see it, too. What is it? ENGLUND: We don’t know, sir. HALT: It’s a strange, small red light, looks to be maybe a quarter to a half mile, maybe further out. I’m gonna switch off. HALT: Is it back again? HALT: Well douse flashlights then. Let’s go back to the edge of the clearing so we can get a better look at it. See if you can get the Starscope on it. The light’s still there and all the barnyard animals have gone quiet now. We’re heading about 110, 120 degrees from the site out through to the clearing now, still getting a reading on the meter, about two clicks. HALT: Needle’s jumped, three to four clicks, getting stronger. ENGLUND: Now it’s stopped... Now it’s coming up... Hold on. There we go... about approximately four foot off the ground, at a compass heading of 110 degrees. HALT: He’s turned the meter off. Gotta say that again. About four feet off the ground, about 110 degrees, getting a reading of about four clicks? ENGLUND: Yes, sir. (Sneezes). Now it’s dying. HALT: We’ve just bumped into the first night bird we’ve seen. We’re about 150 or 200 yards from the site. HALT: Everything else is just deathly calm. HALT: Pieces of it are shooting off. HALT: Keep your flashlights off. There’s something very, very strange. Get the headset on, see if it gets any stronger. HALT: It’s on a beta reading? NEVELS: The beta shield has been removed. ENGLUND: ...off to the right. HALT: ...and we’re getting what kind of readings now? HALT: We’re getting three good clicks on the meter and we’re seeing strange lights in the sky. HALT: 2:44. We’re at the far side of the farmer’s...the second farmer’s field and made sighting again about 110 degrees. This looks like it’s clear off to the coast. It’s right on the horizon. Moves about a bit and flashes from time to time. Still steady or red in colour. Also after negative readings in the centre of the field we’re picking up slight readings, four or five clicks now, on the meter. Col. Halt’s route from the landing site across the field, past the farmhouse and on through the second field can be followed on this aerial view. For a map of the area, click here. 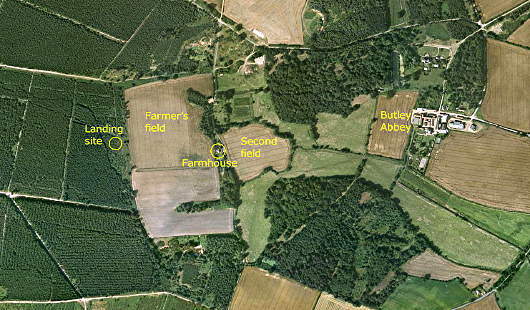 The map shows what is apparently the “creek” mentioned by Halt on the eastern side of the second field. The far side of this second field is about half a mile from the supposed landing site. HALT: Now we’re observing what appears to be a beam coming down to the ground. HALT: The object to the south is still beaming down lights to the ground.